Consider these facilities when planning your next meeting. 4,000 sq. ft. of available, elegant meeting/ballroom space. Selection of audio visual and other meeting/banquet rental items available. On site catering available. 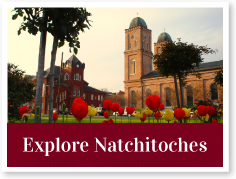 The Natchitoches Events Center is located in the heart of the Oldest Permanent Settlement in the Louisiana Purchase Territory and in the middle of the 33-block Natchitoches National Historic Landmark District, one of only two in the entire state of Louisiana. The facility is within walking distance of scenic Cane River Lake, the new Beau Jardin water gardens, unforgettable shopping at downtown shops and boutiques and delicious cuisine at local restaurants. The Prud'homme-Rouquier House is one of the most architecturally significant buildings in the Natchitoches Historic District. 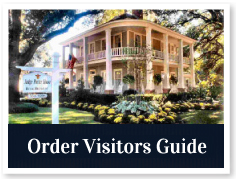 Constructed between 1790 and 1811, this home predates most other surviving buildings in downtown Natchitoches. Although the exterior was remodeled in 1825 to resemble the Federal or Greek Revival style, it was originally a French Creole building. The builders of the home used the traditional French Creole method of erecting cypress beams and filling in the spaces with bousillage (a mixture of mud, Spanish moss, and deer hair).